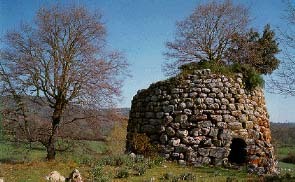 The protagonist of sardinian prehistory is the Nuraghe (read noorage), early witness of rational building capability, as indicated by the conic shape that helped to settle big stones from the base to the top of the buildings. The shape and strategic placement of the Nuraghes seem to prompt to the initial hypothesis of buildings having military and defense aims. Such an hypothesis is not completely convincing after recent findings indicating with certainty a religious usage and purpose. Nuragic civilization in Sardinia runs along about 1.000 years of history: from the 17th to the 7th century B.C . .
Only a few of the about 8.000 sardinian nuraghes are appreciable and offer a service to their visitors: among them the Nuraghe Losa, in the province of Oristano, the Nuraghe of Barumini in the province of Cagliari and the nuraghe Arrubiu of Orroli. 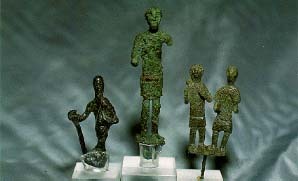 The nuragical age is characterized by the metallurgy of bronze, as witnessed by famous "bronzetti", little bronze statues reproducing particularly warriors, animals, models of nuraghes and boats. They give an image of a civilization of peasants and shepherds, whose aristocratic class, in the role of warriors, acquires a major social importance. It is possible to admire a good representative examples at the Archeological Museums of Cagliari and Sassari.